The WMR200 Professional Weather Station from Oregon Scientific gives you all the weather data you’ll need - right from your own back yard!. 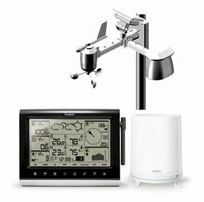 The WMR200 weather station is equipped with a touch-panel interface for quick and convenient information access. The WMR200 is capable of capturing over 10 weather measurements from up to 300 feet away. Enjoy convenient access to measurements such as current indoor and outdoor temperature and humidity, wind speed and direction, wind chill, dew point, heat index, barometric pressure, rainfall data and precise atomic time. The WMR200 can support up to ten remote sensors for additional weather monitoring, including an optional UV monitor. The onboard memory and free PC software with multi-language capability round out the package and make this a full-featured weather center for an affordable price. The Oregon Scientific WMR200 Professional Weather Center is a great choice when you're looking for a high quality weather station for a very reasonable price. Browse the selection of discounted WMR200 wireless weather stations and accessories that are currently for sale on eBay - you simply won't find lower prices anywhere else! If you don't see what you need search here for even more weather stations.